Large-scale festivals provide the perfect showcase for local companies pushing beyond the limits of self-presentation. Perth-based Barking Gecko Theatre Company has worked with Opera Australia and in association with West Australian Opera to expand its scope with a new opera, The Rabbits. Broome-based Marrugeku has collaborated with an impressive range of commissioning partners from Germany to New Caledonia to incorporate dance, song and media in Cut the Sky. Marrugeku brings Cut the Sky to festival audiences prepared for a challenging work that defies simple categorisation. Its scope is ambitious, tackling history, Dreaming mythology, dispossession, land rights, climate change and the resources industry. Musically, Matthew Fargher oversees a rich range of musical styles that enhance the emotional impact of the work’s diverse messages. Ngaire Pigram’s voice is not entirely suited to Nick Cave’s songs, but her reaching for the notes adds intensity to the experience of angst, appropriate to the subject matter. “Ngiyampaa Song” (sung in Ngiyampaa Wangaaypuwan language) and “Wadampa lu Ring-ganga gangany” (“Flood water brings debris,” sung in Nykina and Walmajarrdi) emphasise the Indigenous ownership of the production. Similarly, the choreography rises to the challenges of diverse themes. While a high level of talent ensures that solo and duet dancing is impressive, group choreography is less inspiring. An exception is an ensemble of four dancers moving not quite in unison but marking key beats with their own interpretations of set movements. A segment addressing the land rights dispute at Noonkanbah in August 1980 is presented with standout clarity, cogently deploying spoken word, archive footage, choreography and musical direction. In a very different way, Edwin Lee Mulligan’s presentation of the crocodile dreaming story is strong in its resonances with images of the staggeringly huge open cut mine; the tale warns against becoming hard of heart with a corresponding hardness of skin. Sequences that should have been more effective were those built around images of devastation, from the impact of extreme events such as the 2004 Indian Ocean and 2011 Fukushima tsunamis. While the program notes for Cut the Sky rightly celebrate the intercultural and interdisciplinary collaborations between Australian artists and those from as far afield as Ouagadougou, Brussels and Guwahati, this very scope is the work’s fatal flaw in its current form. Cut the Sky is overextended and without enough mass and momentum at its heart to develop a sense of itself and take the audience with it. 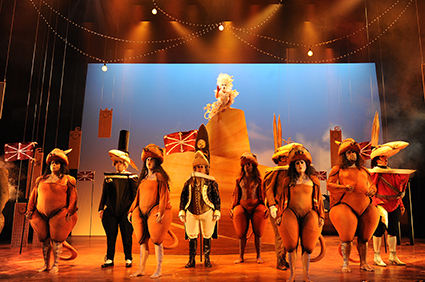 While Barking Gecko Theatre Company has adapted many works from book to stage, The Rabbits sees new levels of ambition in employing operatic form and also in expanding the scope of a work about Australian colonial experience to embrace a universal experience of colonisation and dispossession. The use of three distinct musical styles—musical theatre for the sweet marsupials, operetta for the bumbling rabbits and contemporary classical for “the Bird” (composer Kate Miller-Heidke’s slightly detached observer figure)—ensures accessibility and engagement for audiences of all ages and musical backgrounds. The sets, costumes and puppetry faithfully echo the aesthetic of Shaun Tan’s source illustrations. There are a few changes of emphasis in libretto and production to novelist John Marsden’s original text. Librettist Lally Katz has retained some of the text and the writer’s economy of style, but uses fewer words with greater impact. The sheer scale of the book’s scenario is limiting, so here legions of rabbits become a handful of individuals, providing a more nuanced understanding of settler culture. While director John Sheedy aims to speak to all experiences of colonisation, the standout scene in The Rabbits in terms of emotional power is the stealing of the children. Some introduced elements, such as young marsupials getting drunk on carrot juice, are not as successful and even a little annoying but with further development on the cards adjustments might be made for an even more successful Melbourne Festival showing this October.